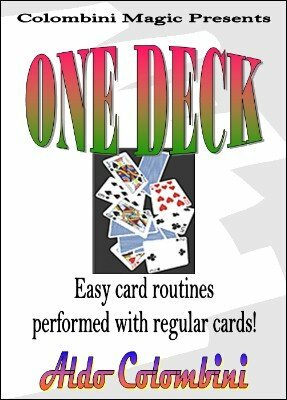 Routines performed with a regular deck of cards. FEELING THE SPOTS (Howard Albright & Ken de Courcy): You reveal a freely selected card from a shuffled deck placed in your pocket. TRAMEZZINO (Aldo Colombini): A card is lost in the deck and four Aces are removed. The Ace of the same suit as the selection turns face down. The Ace is now face up in the deck and the face-down card in the Ace packet is the actual selected card. THE ULTIMATE GAME (Karl Fulves & Roy Walton): Amazing predictions with all the cards under the spectator's control. COMPELLING (Aldo Colombini): A lot of magic happens with two selected cards and the four Kings (the Kings change places, disappear, find the cards, etc.). ROYALE MAYO 2 (Didier Dupré): One after the other the cards necessary to reveal a Royal Flush appear between two Deuces. IT'S A DONE DEAL (Paul Gordon): A disarming puzzling routine where a spectator reveals a freely selected card. ALL MY SORROWS (Aldo Colombini): You show four Aces in one packet. Three Aces reappear in another packet and the last Ace is found between two previously selected cards. THE INCREDIBLE PREDICTION (Jack Avis): You predict a card chosen under the fairest possible conditions after the deck has been shuffled by a spectator. QUADRUPLICATION (Nick Trost): After the deck has been shuffled you lay on the table four prediction cards face down. A spectator cuts the deck into four piles. The top card of each pile is shown and it is a 'mate' of the four predictions. MAN OF MYSTERY (Aldo Colombini): Two cards are selected. A card is removed, say a 4. The deck is cut into two packets. Counting down four cards you reveal both selected cards. Then you reveal the mates of those cards.